If you’re frustrated & confused, wondering why your kids are treating you like dirt, let me tell you that you’re not alone. She was asking what you should do when kids treat you like dirt & flat out dislike you. What should you do when kids treat you like dirt & flat out dislike you? There have been a few students that are difficult & she finds herself being the hardest on them when behavior needs to be addressed. These students think she’s out to get them, and a few have even told her that they hate her. Now they’re in a struggle where the students intentionally try to make her life miserable and she tries to give out some sort of punishment. She’s confused and frustrated and wondering if there’s a way out. First, let me repeat: You are not alone. I’ve been there, too, and so have many other teachers. The first year is really hard. It just is. You’re trying to figure out what to do & the students can sense your confusion and struggle and feed off that. There’s no simple way out of a cycle like this, but I want you to know that if you keep learning & growing, in time you’ll gain confidence & learn how to deal with challenging students. And one day you’ll actually be able to enjoy teaching without being paralyzed by fear over what the students are going to do next and how you’re going to handle it. Pray. Pray for the students, pray for peace, pray for wisdom. Ask Him to give you strength and guidance, to help you see these kids through His eyes, and to love them unconditionally. Notice the good. Be on the lookout for anything these students do well & praise them for it. This can be especially helpful when you’re having a rough day with them. Look for something – anything – positive to say & say it in front of the whole class. Ask advice from fellow teachers. Talk to the teachers who had these students last year – or to the other teachers who teach them now. Don’t let this be a bashing session, but instead ask for advice and ideas. If those teachers aren’t able to help you, ask advice from a teacher who is experienced and has great classroom control. Be consistent with your procedures and expectations. Yes, this is hard but it’s also a key to your long-term success. I wrote a whole post about how hard it is & how to overcome the challenges here. If you’re having particular trouble with a certain procedure or behavior, I recommend trying a classroom shake-up. Check out my article “How to Fix a Problem Area in Your Classroom” for details on how to do this. Don’t take it personally. Even though it seems personal, it’s probably not – at least not on their end. They’re just testing rules & boundaries and you are the enforcer. If you manage the situation well, they’ll ease up. If not, then it will become personal. The best remedy is consistency. Greet them with the same friendliness that you greet the other students. Smile a lot and chat with them whenever you get a chance. Check out whole brain teaching. Whole brain teaching has so many great ideas that really work well for tough classes. Check out my article “A Miracle-Working Solution to Tame Your Out-of-Control Class” for more info. Try the 2 x 10 strategy. Angela Watson explains this strategy in this post here, but the basic idea is that you determine to spend 2 minutes a day speaking to a challenging student about anything not related to school – and you do that for 10 days. Teachers have reported incredible results from this simple effort to build a relationship. Give choices. For example, if a student is throwing a fit and refusing to do something, give a choice such as “Jim, you have a choice. You can pick up your pencil and finish it, or we can practice together during your free time.” Stay calm & try to avoid a power struggle. Those don’t end well. Have a heart-to-heart conversation with the chief offenders. This may sound like the scariest advice ever, but sometimes a few intentional conversations can make all the difference. This is especially effective if you seek first to understand. Check out my articles “The One Change that Will Revolutionize Your Discipline” and “The Only Way to Solve Discipline Problems for Good” for tips on how to do this. Keep your administrator in the loop. 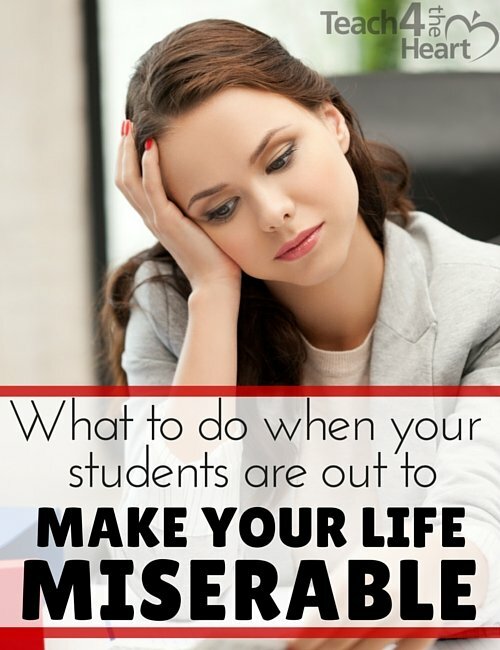 I know how hard it is to admit you’re having trouble with your class, but it’s wise to cue your administrator in now, rather than their finding out from someone else – or when a huge problem makes it unavoidable. Your administrator should be able to give you some advice, help you come up with a workable plan, and back you up when needed. Don’t give up. As you can see, none of these tips will change things overnight. It will take time, consistency, and patience, but you’ll notice things gradually start to improve. Take it from all of us that have been there and lived to tell the tale – things will get easier. And the real magic happens when you take all these lesson you’re learning and implement them on day one of the next school year. Get classroom management training. Build your confidence & skills with classroom management training. You can get my free classroom management mini-course here or enroll in Classroom Management 101 here to learn everything you need to regain control of your classroom. What other advice would you give this teacher? Share your experience or thoughts with a comment below. thanks! sounds like some great advice. I’ve been teaching for 30 years (forever) and I’m still getting occasion kids who are tough to crack. These very good ideas are very worthwhile to think about. I really appreciated these comments. So many are things pre-service teachers study but a new classroom can be so challenging. I think the first recommendation is the most important and it helps me not to take attacks personally. Prayer, even a whispered one under my breath, helps me stop and remember that God loves me and he has a good things for my class. He wants to love on each student that he is bringing through my door and I am his bridge. Some one told me once “You may be the only Jesus your students ever see.” It may sound a bit cliché but it may also be true. If I remind myself that hurting hearts try to hurt others it gives me patience and peace to practice calmness, to find the good, to reach out to the obnoxious ones, and to practice kindness. But its only in his strength I can do any of those things so a quick “Help!” makes a world of difference.